That was never true and even may have led to the downfall of the Soviet Union. It’s also not true for communications. A successful media and marketing strategy is a collection of well-crafted informational components that interlink to convey the message of a company, a product, a program. The foundation of that strategy is writing - clear, tight, attention-grabbing phrases best produced by a seasoned wordsmith. 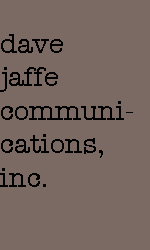 To effectively develop, target and deliver your message Dave Jaffe Communications offers professional writing services combined with rich, media relations experience. Dave doesn’t claim to have brought down communism, at least not on his own. But note this: Communism is gone. Dave remains. Do the math. "Dave doesn’t claim to have brought down communism, at least not on his own."